【 GOT ROCK? 】　The Toyota Land Cruiser 40 was produced from 1960 to 1984 and is one of the most well-known 4x4 vehicles in the world. 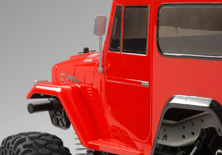 Tamiya has reproduced this classic off-roader as an assembly kit R/C model on the newly developed CR-01 rock crawling chassis. 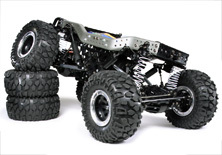 This chassis features a tough ladder frame with aluminum side channels and resin crossmembers, 4-link suspension with aluminum rods, a 4WD system with lockable differentials, massive off-road tires with sidewall tread pattern, and dependable beadlock wheels. 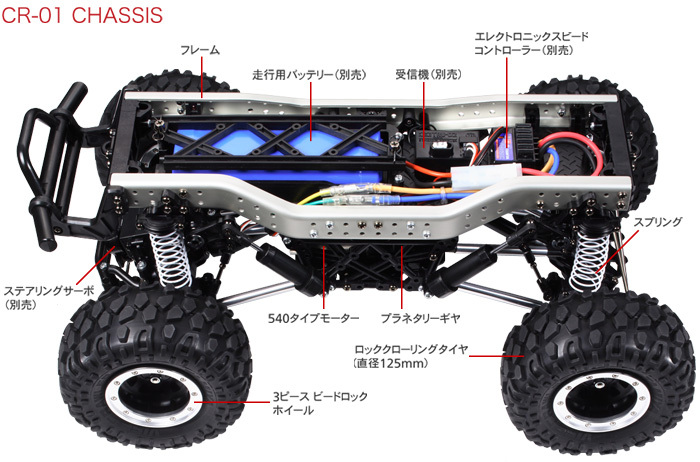 The body is of course accurately reproduced in durable polycarbonate material, giving fans a superbly capable rock crawler with scale realism. 【 About the Land Cruiser 40 】　Toyota's Land Cruiser 4x4s are known throughout the world for their legendary off-road ability. Toyota began production of the Land Cruiser in 1950, and the Land Cruiser 40 that was made from 1960 to 1984 in particular was an exceptional long-seller. 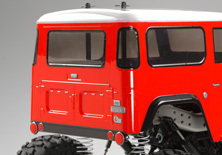 Even now, this classic 4x4 still has a large following. The distinctive body styling is highlighted by the oval radiator grille, turn signals on the front fenders, and rear corner windows. With its reputation as a dependable and durable vehicle, many are still earning their keep in harsh conditions and it is the vehicle of choice for many real life rock crawling competition drivers. 4-link rigid suspension features front and rear stabilizers and provides sure-footed performance. 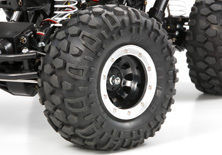 Tires feature inner sponge and tread pattern on the sidewalls to provide maximum grip in rock crawling environments. They are mounted on 3-piece beadlock wheels. Dampers are actuated via pushrods and rocker arms. 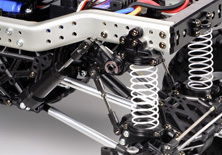 Separate coil springs act as tension springs to help maintain a controllable stance. 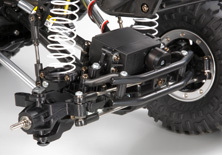 Steering servo is mounted in a servo bed above the axle in an innovative way so as to not interfere with suspension movement. 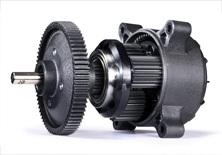 Compact gearbox tranfers power to all 4 wheels and the small size enables lower battery position for better center of gravity. 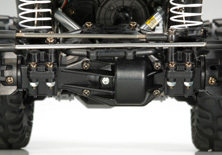 Front and rear 3-bevel diffs can be locked to provide the ultimate level of off-road traction. Unique oval-shaped grille is separately-molded and separately available LEDs can be installed for realistic headlights. 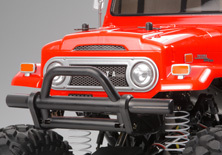 Small details such as the anti-slip texture on the side step and the hood hinges are sharply rendered. Side mirrors are made from durable resin. Corner windows are just like the actual car, and separately available LEDs can be installed to the tail light positions.